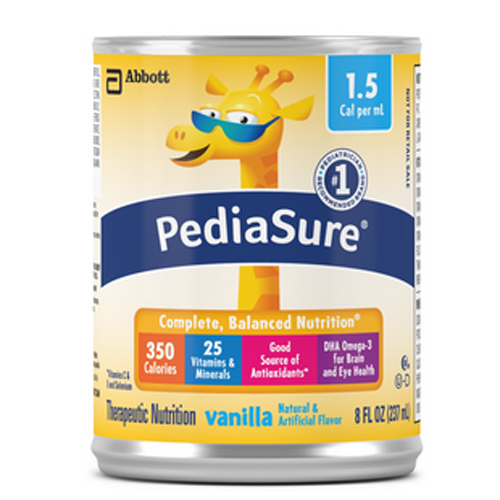 PediaSure® 1.5 Cal Complete, Balanced Nutrition by Abbott Nutrition delivers its promise of bringing balanced nutrition with caloric density. It comes ready-to-drink in great tasting vanilla flavor. It may be used as a sole source of nutrition or as a supplement to a child's diet. 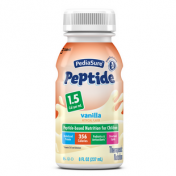 It has 50 percent more calories over regular PediaSure to support weight gain. It's formulated for oral use or for tube feeding for pediatric patients with energy requirements, who are at risk for malnutrition, needing a higher caloric density, and/or have fluid restrictions. 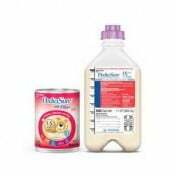 PediaSure 1.5 Cal packs a punch in nutrition. It meets or exceeds Dietary Reference Intake values for protein. 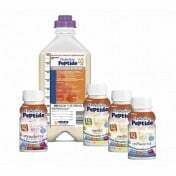 It meets the acceptable macro-nutrient distribution range of protein for children ages 1 to 13. It's packed with DHA omega-3 to support brain and eye health and antioxidants to support the immune system. It contains 25 essential vitamins and minerals for children ages 1 to 8 in 1000 mL and for children ages 9 to 13 in 1500 mL. Formula is designed for children 1 to 13 years of age and not for infants unless directed by pediatrician. Children with a galactosemia allergy should not use this product. Liquid Vanilla: Water, Corn Maltodextrin, Milk Protein Concentrate, High Oleic Safflower Oil, Soy Oil, Medium-Chain Triglycerides. Less than 0.5 percent of the Following: Natural & Artificial Flavor, Potassium Citrate, Cellulose Gel, Magnesium Phosphate, Potassium Chloride, Soy Lecithin, Monoglycerides, Salt, Calcium Phosphate, Choline Chloride, Ascorbic Acid, C. Cohnii Oil, Cellulose Gum, m-Inositol, Potassium Hydroxide, Carrageenan, Taurine, Sucralose, Ferrous Sulfate, dl-Alpha-Tocopheryl Acetate, L-Carnitine, Zinc Sulfate, Calcium Pantothenate, Niacinamide, Manganese Sulfate, Thiamine Chloride Hydrochloride, Pyridoxine Hydrochloride, Riboflavin, Cupric Sulfate, Vitamin A Palmitate, Folic Acid, Chromium Chloride, Biotin, Potassium Iodide, Sodium Selenate, Sodium Molybdate, Phylloquinone, Vitamin D3, and Cyanocobalamin.Source of docosahexaenoic acid (DHA). Contains milk and soy ingredients. Store unopened at room temperature or refrigerate. PediaSure 1.5 Cal tastes better when chilled. Clean top of can before opening. If ready-to-drink can is open and unused, refrigerate and use within 48 hours. Consult physician before using. Each child has a different flow rate, volume, dilution and need for additional fluids. We do not outsource our products to retail stores. We can; however, ship out products to a location of your choosing. Our delivery service can get products to an area in as little as 7 days. We are using this product under teh supervision of our child's Pediatric Gastroenterologist. He has had trouble gaining weight since shortly after he was born. Nothing seemed to work including regular Pedisure. 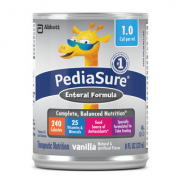 As soon as our doctor switched us to Pediasure 1.5 he began to gain weight. I can't say enough good things about this product. It's so nice to no longer have to be concerned about our child's weight gain. Both of my children are severely autistic with oral aversions. They refuse foods of any form and will only take liquids. 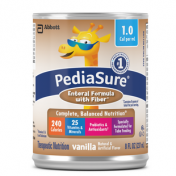 Pediasure is not recommended for sole source nutrition but in a case like mine... what do you do? Follow doctors orders i guess!! Daughter is on a feeding tube and finally gaining weight!! And son is maintaining weight. You cannot beat these prices. You just can't. My 2-year-old daughter has issues gaining weight because she was born with Cystic Fibrosis. This product - because of its high calories and nutrients - has significantly helped her. She also loves the taste of it, especially when it's served cold. This product is excellent. Has all the nutrients are kids need. It keeps kids healthy!